Refreshed content is the key to a successful online world. Mike is an artist and has a gallery to showcase his work. Most of Mike’s business is from walk-by customers. 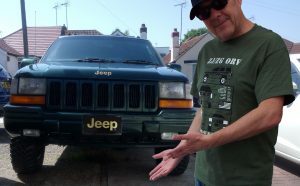 However, to reach further afield Mike created a website to sell his work online. Now if Mike had more time on his hands, he’d update his website periodically, add a few new images and log the traffic figures. However, Mike is too busy to refresh his website because it may interfere with productivity. But ignoring refreshed content completely could cost Mike’s business dearly in the future. 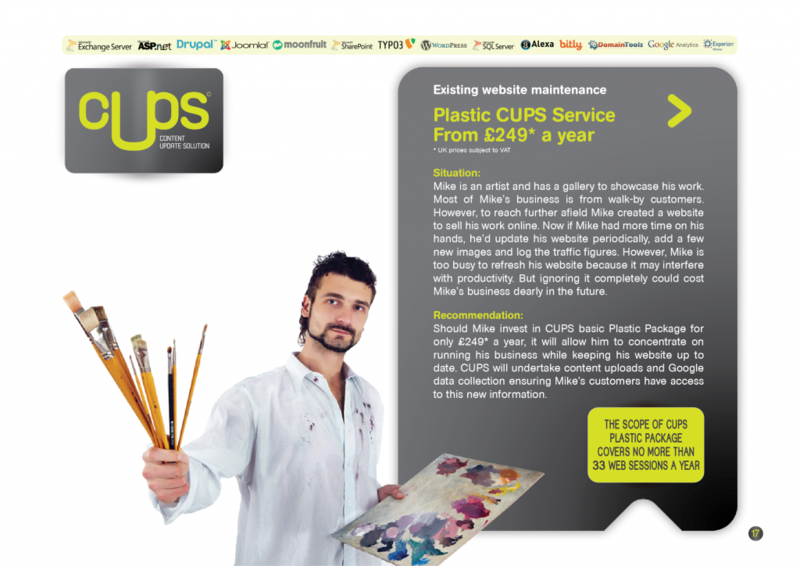 Should Mike invest in CUPS basic Plastic Package for only £249* a year, it will allow him to concentrate on running his business while keeping his website up to date. CUPS will undertake refreshed content uploads and Google data collection ensuring Mike’s customers have access to this new information. 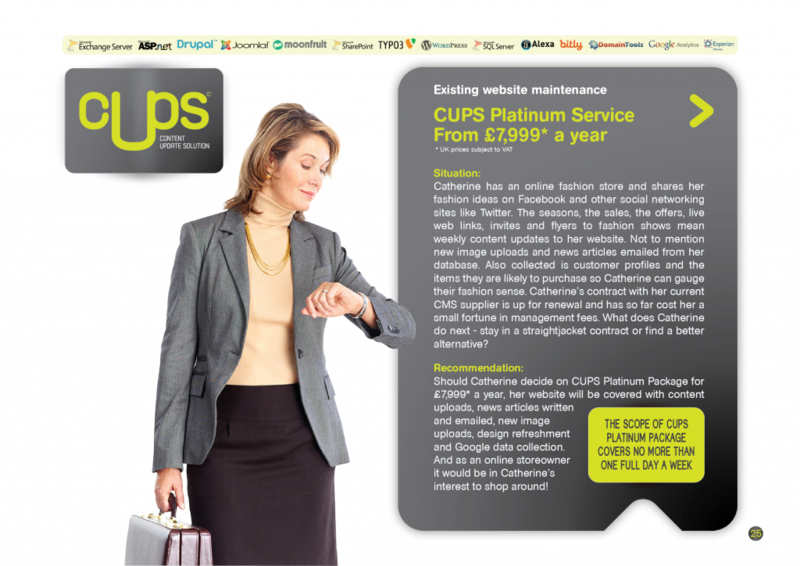 THE SCOPE OF CUPS PLASTIC PACKAGE COVERS NO MORE THAN 33 WEB SESSIONS A YEAR Existing website maintenance * UK prices subject to VAT. Kevin runs a thriving business selling confectionary to the tourist retail market. With busy warehouse duties and managing the staff, Kevin simply hasn’t the time to also maintain the company’s website. Occasionally Kevin will upload the odd picture and send annual Christmas messages to clients. This isn’t enough however to stave off the refreshed content of competition. 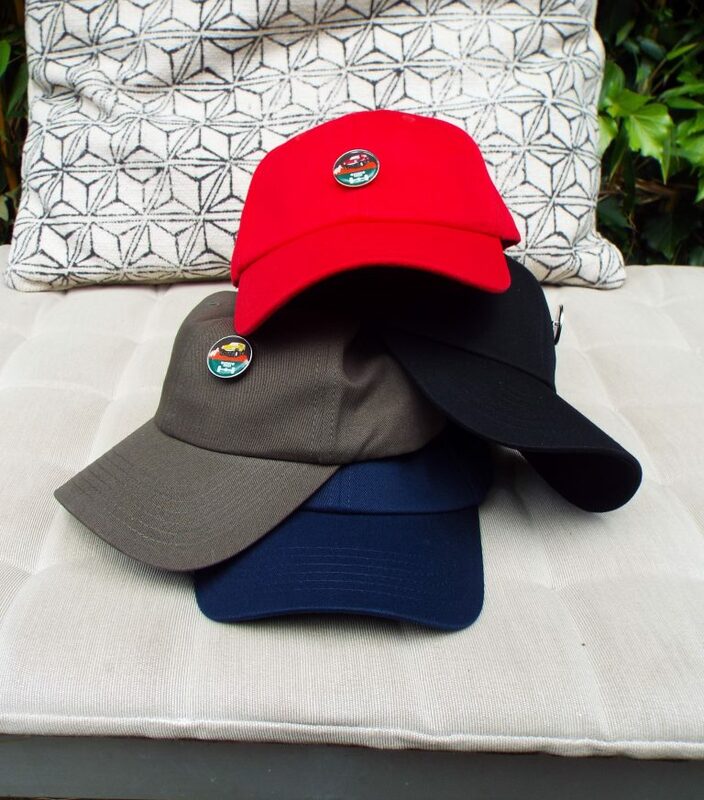 But by giving his wholesale business an advantage and a foothold into bigger markets, all Kevin has to do is keep his website updated and inform his clients of the new offers and discounts. 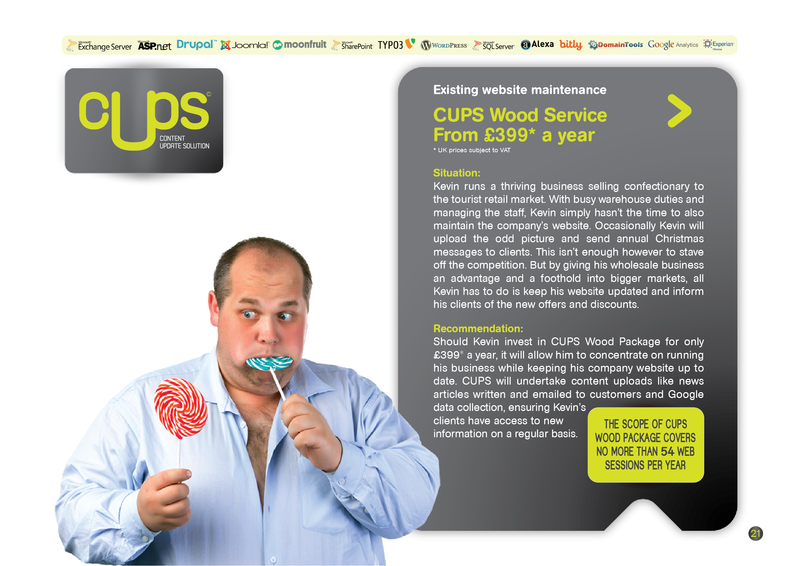 Should Kevin invest in CUPS Wood Package for only £399* a year, it will allow him to concentrate on running his business while keeping his company website up to date. CUPS will undertake refreshed content uploads like news articles written and emailed to customers and Google data collection, ensuring Kevin’s clients have access to new information on a regular basis. Linda is a marketing and communications executive for a manufacturing company. Year on year the company has grown and acquired new contracts. 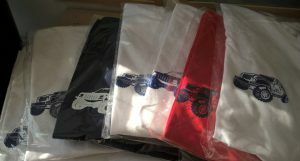 To announce new business wins, Linda has to inform the business community and the media while also supporting the company sales team and the website with updates. A PR agency will usually undertake such a task but Linda has a tight budget. For cost-effectiveness and maximum media exposure, Linda has to reach a wider audience with refreshed content, while also gauging their feedback and increasing the company’s profile – all in one swoop. 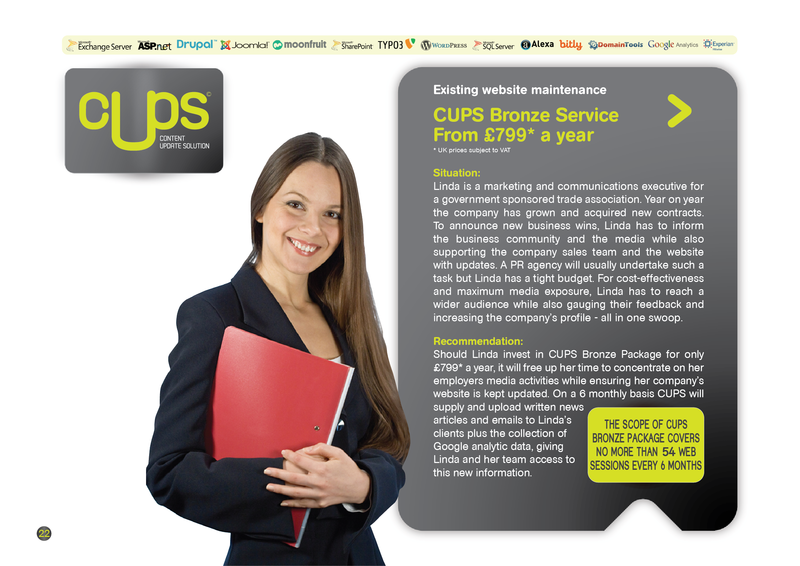 Should Linda invest in CUPS Bronze Package for only £799* a year, it will free up her time to concentrate on her employers media activities while ensuring her company’s website is kept updated. On a 6 monthly basis CUPS will supply and upload refreshed content, written news articles and emails to Linda’s clients plus the collection of Google analytic data, giving Linda and her team access to this new information. Company Director Roy has four 90 day quarters in his business year that need reflecting on his website. This includes; refreshed content, news articles, photos and downloadable product literature, all of which need updating to support the webpages. Plus Roy also has to gauge the website’s traffic flow and the conversion rates, all of which could influence future web content. Roy has to personally collate, file and rewrite this content and to add to his woes, he has a further requirement for creating PDF documents containing live web links. Now if Roy was an IT wizard he would have no problems managing this job. However, Roy isn’t! 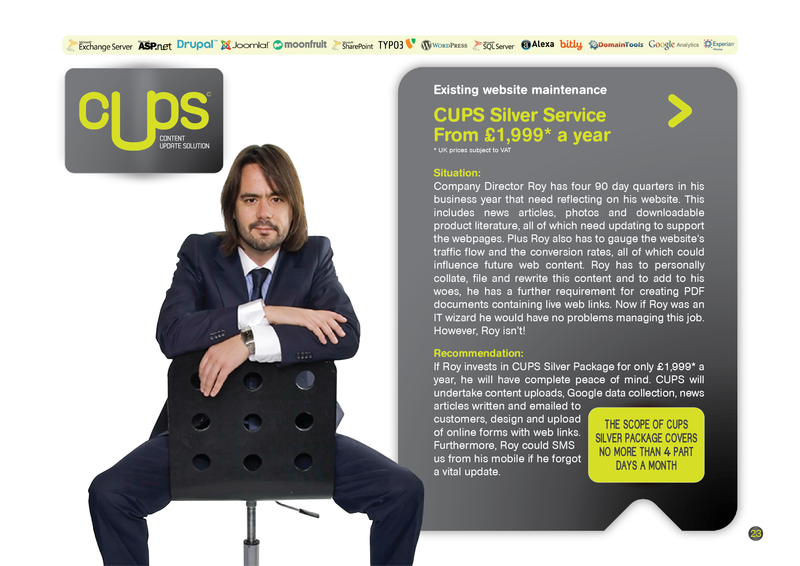 If Roy invests in CUPS Silver Package for only £1,999* a year, he will have complete peace of mind. CUPS will undertake content uploads, Google data collection, news articles written and emailed to customers, design and upload of online forms with web links. Furthermore, Roy could SMS us from his mobile if he forgot a vital update. Nick runs an architects practice and has a company website to showcase their latest projects at both home and abroad. On a regular basis Nick has to update the website with 3D architectural renditions of their designs and also supply refreshed content and write news articles to accompany them. In addition Nick has to upload high-resolution photos to their image library so his clients can access them for marketing purposes. To satisfy Nick’s Gulf-rich clients, the website also has arabic translated content. This can be very time consuming and a heavy burden on Nick’s busy practice. Nick could do all this work in-house, but he will then have to employ a full-time staff member – at a cost. Alternatively Nick can find a better, less costly solution. Should Nick decide to invest in CUPS cost-effective Gold Package for £3,999* a year, his company could save up to £25,000 annually in salaries! CUPS will undertake all content management and update and supply Google analytic data. Catherine has an online fashion store and shares her fashion ideas on Facebook and other social networking sites like Twitter. The seasons, the sales, the offers, live web links, invites and flyers to fashion shows mean weekly content updates to her website. 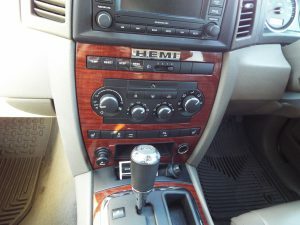 Not to mention new image uploads, refreshed content and news articles emailed from her database to her opted in customers. Also collected are customer profiles and the items they are likely to purchase so Catherine can gauge their fashion sense. Catherine’s contract with her current CMS supplier is up for renewal and has so far cost her a small fortune in management fees. What does Catherine do next – stay in a straightjacket contract or find a better alternative? Should Catherine decide on CUPS Platinum Package for £7,999* a year, her website will be covered with content uploads, news articles written and emailed, new image uploads, design refreshment and Google data collection. And as an online storeowner it would be in Catherine’s interest to shop around! 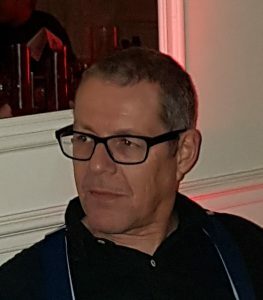 Managing Director John’s work involves the sales of industrial machinery throughout the UK and Europe. At a moments notice John’s clients may require specific equipment therefore John has to be covered for such emergencies. With a refreshed content updated website his clients could view the products and specifications at first hand, place their orders and even ask questions. John’s clients need assuring they’re in good hands so the professionalism of his website and app must take precedence, especially with its informative content, easy to navigate web pages and up-to-the-minute email responses. John already has his hands full so can he manage the website too? 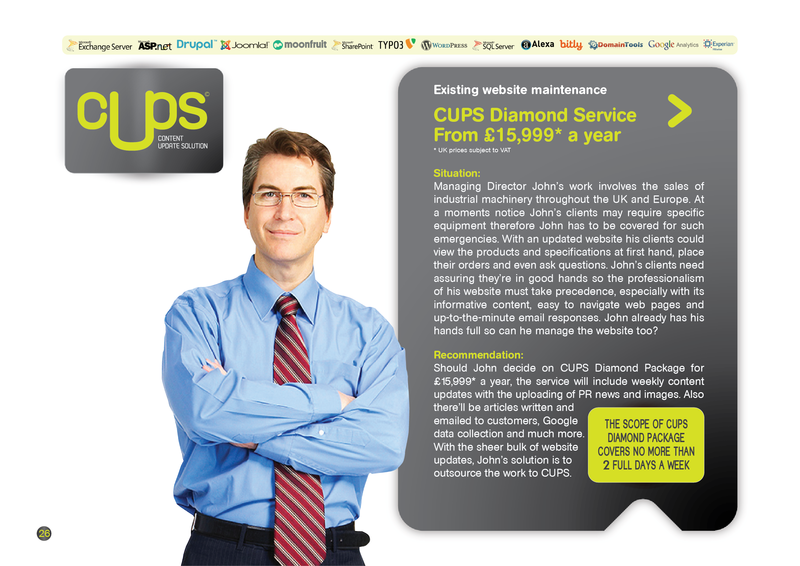 Should John decide on CUPS Diamond Package for £15,999* a year, the service will include weekly content updates with the uploading of PR news and images. Also there’ll be articles written and emailed to customers, Google data collection and much more. With the sheer bulk of website updates, John’s solution is to outsource the work to CUPS.